A few months back in Summer I discovered this gorgeous salad. Herbs and toasted nuts just lift vegetables in such magical ways, which I adore. And the salad can keep well in the fridge so saves you on making lunch the next day- just add some feta cheese, tuna, salmon or smoked chicken. Ingredients for the hazelnut oil dressing and mixed in a jar, shaken – with the lid on! Wash and cut all vegetables. Toast the hazelnuts in a hot oven for a few minutes until slightly browned further, but not burnt! Place a large pan of water on to boil or a steamer over top if you have one. Add the asparagus to the boiling water or steamer and cook for 1 minute. 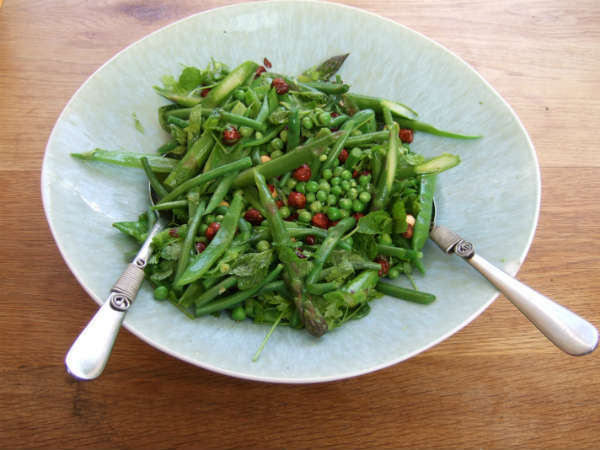 Then add the snow peas mange tout, green beans and peas and cook for a further 30 seconds. Drain and pour cold water over the top for a minute and make sure well drained. I like to just cool them enough that they are ever so slightly warm as they absorb the dressing so much more than when they are very cold. To prepare the dressing: Mix all dressing ingredients in a small jar or bowl. Stir or shake well with the lid on. Taste for how much salt and pepper you like. Place the well drained green vegetables in a bowl, with the herbs and toasted hazelnuts. Pour over the dressing and gently mix. Serve as a side to a main meal such as with lamb cutlets or barbecued meats. Alternatively this is lovely for lunch with feta cheese, salmon, smoked chicken or other cold meats.